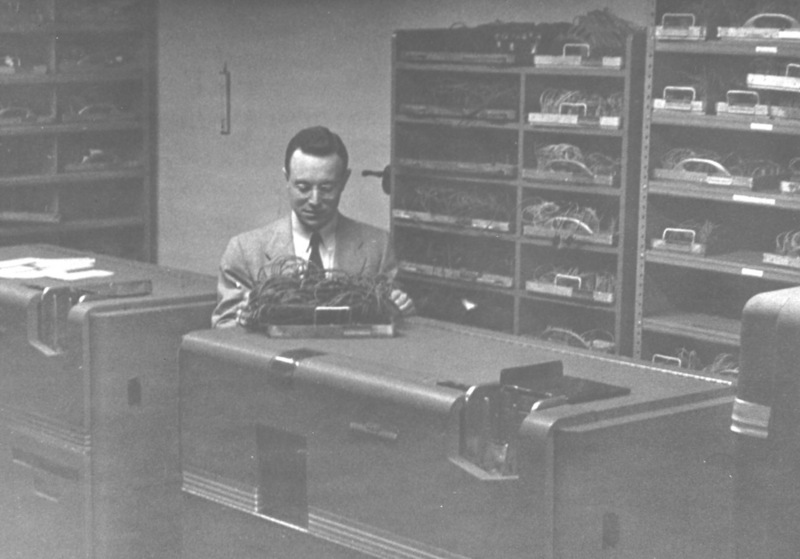 Eric Hankam in the Watson Laboratory program library, in the days when programs were wired onto plugboards. Pictured: a pair of IBM Type 602-A Calculating Punches, which dates the picture between 1948 (when the 602-A was released) and 1959 (when Eric left the Lab). The larger machine to the right might be part of an IBM Card Programmed Calculator. CLICK HERE for a photo of Eckert and Thomas in the same spot. Photo from the collection of Eric Hankam. Click on image to magnify to full size.